Hello Guys, We share some beautiful and best dialogues of Naseeb Amitabh Bachchan Movie which was released in 1981. This is an action comedy film directed and produced by Manmohan Desai. Amitabh Bachchan & Shatrughan Sinha are in the main lead role other Hema Malini, Rishi Kapoor, Shatrughan Sinha, Reena Roy, Kim, Pran, Kader Khan, Amjad Khan, Prem Chopra, Shakti Kapoor, Amrish Puri and Yusuf Khan are in supporting roles. This was also a super hit film of Amitabh. The film also remade in Tamil as Sandhippu (1983), with Sivaji Ganesan and Prabhu Ganesan, and in Telugu as Trimurtulu (1987), with Daggubati Venkatesh. The film music is awesome, composed by famous musician Laxmikant-Pyarelal. The film story based on lost and found a theme. The movie has some famous dialogues, punches, and lines which are delivered by Amitabh, Shatrughan Sinha, and others actors. 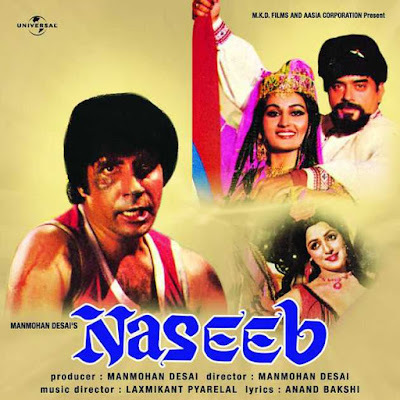 Here, We have collected all best dialogues of Naseeb Movie starring Amitabh & Shatrughan Sinha. I hope, you will like my post. "Kapde badalne se aadmi ki asliyat nahi badal jaati"